When was the Iron Age? Where did the Anglo-Saxons come from? Why did World War II Start? 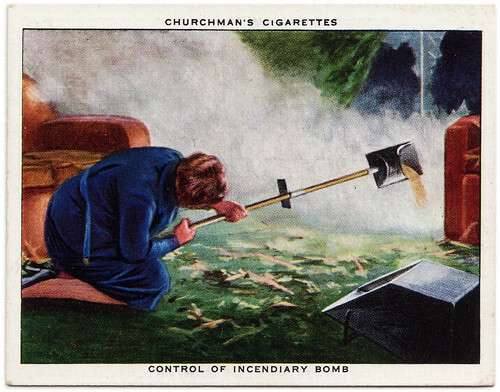 Fire watchers had to look out for small incendiary bombs landing and extinguish them before a fire could take hold. They were issued with: a bucket of sand, a bucket of water and a stirrup pump. Workers in munitions factories made weapons (guns) and ammunition (bullets, hand grenades and bombs) needed by the armed forces. This was a dangerous job because of the risk of explosions so nobody was allowed to take anything that could cause a spark into the workshops, like: matches or rings. As the war went on, many more women were needed to join the workforce. On 8th May 1943, war work was made compulsory for all British women aged 18 to 50 – only mothers with young children were excused. By this time, women were: driving buses, loading trains, sweeping streets and delivering post and milk. Nearly 5 million women also went to work in factories and shipyards, working as machine operators or fitters. Those in the Women’s Volunteer Service: organised evacuations, helped the emergency services, became first aid nurses or worked as cooks in mobile canteens.